This dreamy Lemon on a Cloud dessert will make all the citrus lovers in your life swoon! 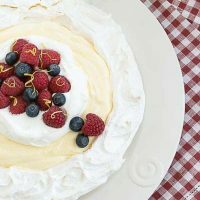 This cloud of meringue topped with lemon curd and whipped cream will have everyone clamoring for seconds! The BEST recipes tell a story. My mom was an excellent cook, and growing up, we wise-acre children didn’t always appreciate her gourmet dinner offerings. Moussaka for example. I’m pretty sure I went to bed hungry the first night that layered spiced lamb and eggplant dish appeared on our table. But we did love when she made desserts. She’d often come home from bridge club with the latest recipe from one of her cohorts, eager to try it out on the family. This lemon on a cloud is one of those gems that’s etched in my memory. We had a huge freezer down in the basement of my childhood home. Perfect for those times my parents purchased a side of beef or made a run to the Sara Lee outlet in Des Moines and came home with boxes and boxes of cheese danish. My mom typically made a double batch of this lemon meringue dessert and popped one in said freezer. But as soon as we knew of its existence, my sisters and I would sneak down to the musty cellar with a knife and carve ourselves slivers of this citrus beauty. I’m certain our fingers were sticky and our sweet tooths satisfied before returning upstairs. Years later, I tried to recreate my mom’s recipe, but I think her version had more of a lemon curd topping followed by Cool Whip. My family loved my creation, but I may have to hunt down the handwritten recipe card next time I’m back in Iowa. It was my first taste of what I later learned was a pavlova! Preheat oven to 200º. Beat egg whites in large bowl until foamy. Gradually add 1 cup sugar, beating until mixture is very stiff and glossy. Add lemon juice. Place parchment paper on baking sheet. Trace a 9 inch circle in middle of paper, then flip so that marks are on underside of paper. Pile meringue into center of circle, then spread to edges, building up perimeter of the meringue to make a shell. 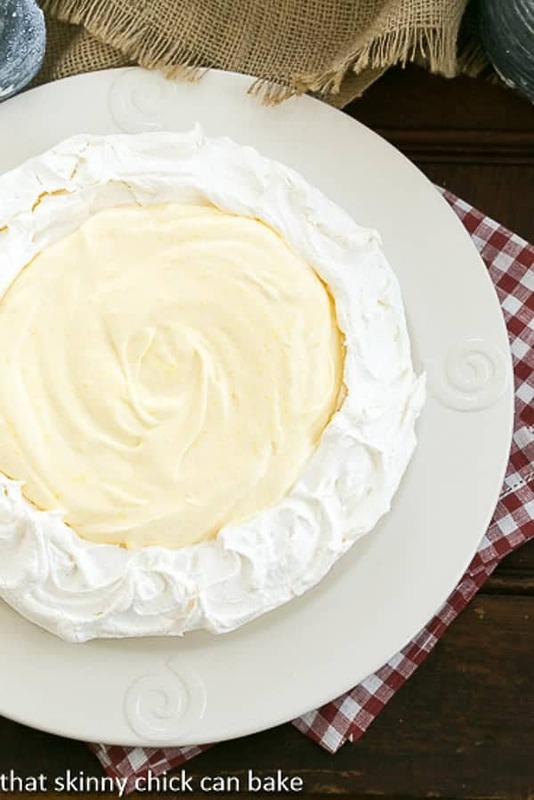 Alternatively, you can bake meringue in a grease 9-inch pie plate. Bake for 2 hours. Cool completely at room temperature. Meanwhile, combine egg yolks, 1/2 cup sugar, and lemon juice in saucepan. Cook over low heat, whisking constantly, until thickened. 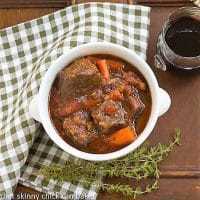 Remove from heat and cool at room temperature, refrigerate until cold. Beat cream until stiff peaks form. Using same beaters, beat lemon filling until smooth. Fold 1/2 cup of the cream into lemon filling until blended, then pile into cooled meringue shell. Reserve the rest of the whipped cream in the refrigerator. Cover and chill for at least 2 hours before serving. Top with remaining cream and berries to serve, if desired. Total time is closer to 5 1/2 hours including cooling times. Looks like a cloud of heavenly goodness to me. What a light dessert and perfect for summer too. What a beautiful name for a dessert! I love it! And it’s amazing that you can create something so fabulous with so few ingredients. I have to admit, though, moussaka is one of my favourite meals! Looks like a beautiful and tasty cloud to me! I also love pairing desserts with a sweeter white wine. 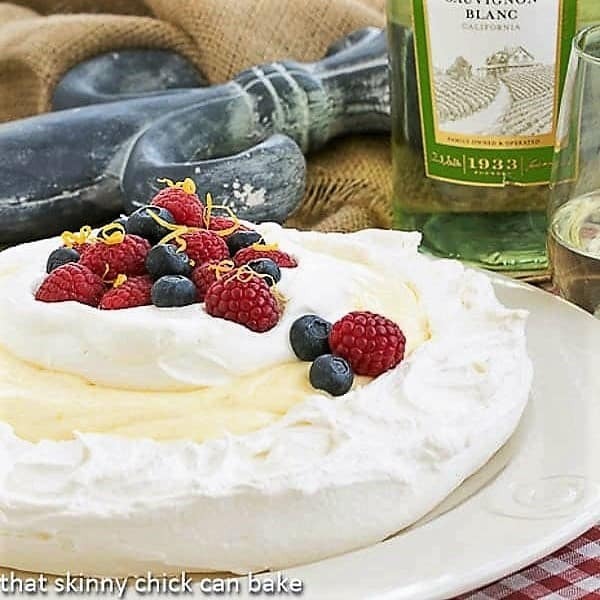 your dessert and wine pairing look perfect! Love that this dessert can be made ahead and popped in the freezer. I will be making this one very soon! I love love love that you made a recipe that your mother used to make for you as a kid. . now wonder you are an excellent cook and baker! This Lemon on a Cloud is soooo beautiful .. and the meringue shell looks perfect!! A pavlova! Love everything about this. Did someone say lemon? I love citrus desserts, and this one is so elegant! 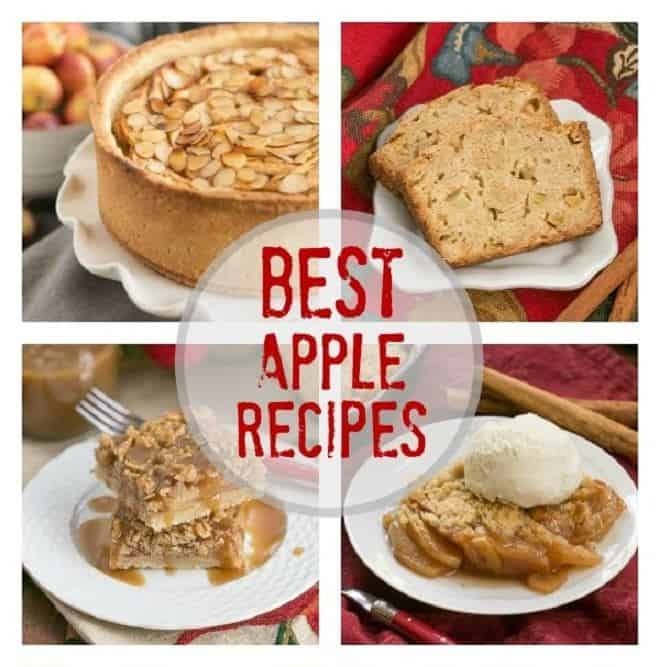 Love that it uses ingredients that I have onhand in my kitchen all the time in Spring and Summer!! 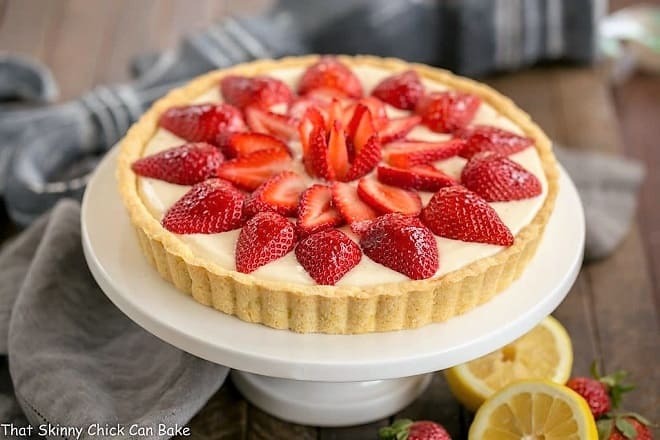 What a beautiful dessert – I can see why you’d sneak some extra bites! It’s funny: I used to do something similar as a kid. My mom would make toffee bars/squares every year around Christmas time, and when we lived in MI and WI, she would put them in tins and set them outside in the garage (since it was so cold). 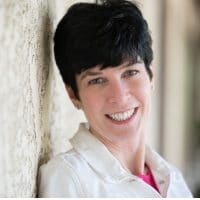 I was notorious for sneaking out into the garage and grabbing a square or two each time I did…and to this day even though I live in Florida, I have to put my toffee squares in the refrigerator so I can eat them cold, haha!). I love the title! Makes me want some right now! 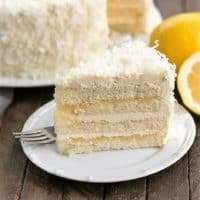 I love using lemon in desserts and I think this screams Sunday family dinner dessert! A perfect ending! I can’t wait to try your recipe! Liz, what a gorgeous dessert!!!! This sounds so lemony good, Liz! Perfect name for it! I have been looking for a recipe like this Liz! A friend of mine from England made pavlova for me one time and I loved it soooo much but never got the recipe. This is perfect!! Oh my. If there was ANY way you could teleport me one of these, I would pay good money for you to do so. This looks like heaven!! Gorgeous story and dessert! What a great title, too! Think this lemon wonder will have me floating on cloud nine! Don’t you love the memories food evokes? I remember going to bed hungry after a few dinners mom put on the table—like fried sweetbreads which I have ordered as an adult with much anticipation (and $$$$$). 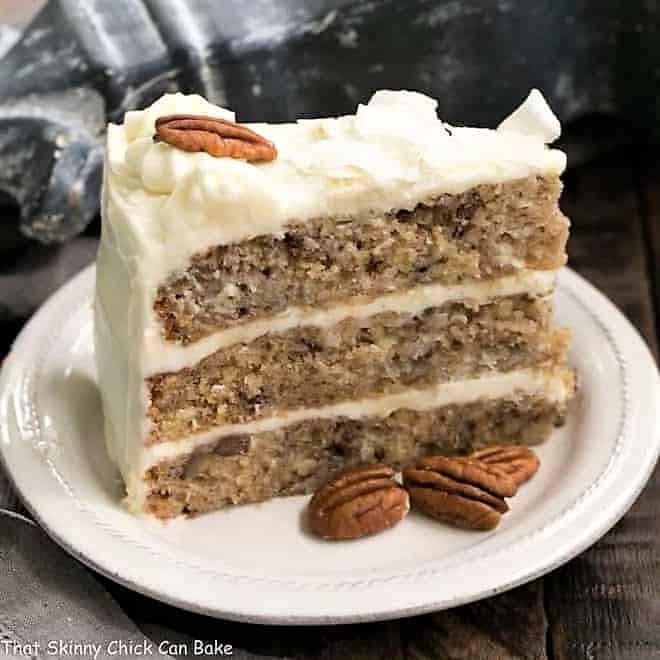 🙂 Perfect dessert with a sweet glass of wine! This dessert screams summer so I am going to take it to mean warmer weather is actually coming our way. So beautiful. My favorite pairings with wine tend to be sweet. Chocolate and red wine is delish. As a kid fed every ground beef and cream of ____ soup casserole, I love hearing about all the things your mom made when you were a kid, since I try to do that for my kids. And this looks like a lovely dessert, even if not exactly what you remember. Just the name of this dish has me wanting a slice! 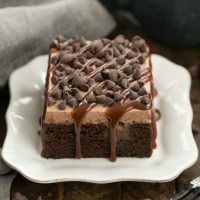 This dessert looks beautiful! It really does look like a cloud. Liz, I love picturing you and your sister sneaking down to the cellar to grab slivers of this dessert! It must be fabulous. Anything described as a cloud sounds perfect for summer! I would love this dessert. I thank your mother for introducing you to this and for you introducing it to us. I love pavlova with fruit and cream and this just takes it one step forward. Brilliant. Lizzy, what a poetic name – Lemon on a Cloud! It looks pretty good what with berries nestled on top, yums! 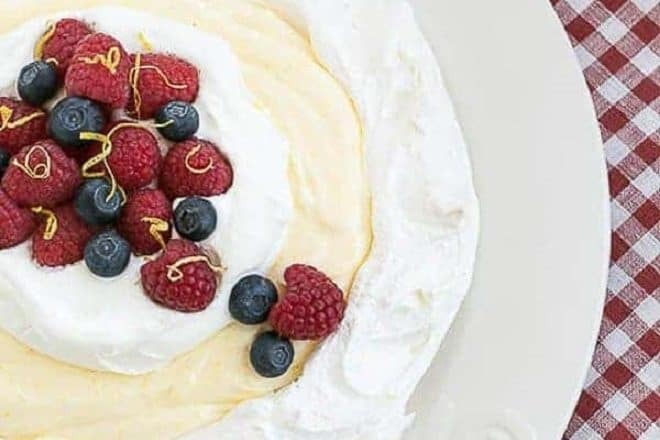 A fantastic meringue dessert with lemon custard and fresh berries! This dessert looks fab, Liz!!!! And elegant as well…Wishing you a great week!! The best recipes definitely do tell a story. Thanks for sharing yours! And my wife would totally love this… she’s obsessed with lemon in dessert! This is such a beautiful dessert! Perfect for spring! Or even heaven, it looks so indulgent! So pretty, I love the contrast of meringue and lemon filling! The name alone is appetizing and sipping Sauvignon Blanc with it sounds perfect. I thought maybe Moscato but they may have been too sweet. You made the right choice for this beautiful dessert. What a beautiful dessert and all the better when it comes with such vivid childhood memories 🙂 we all have favourites from our mums own cookbook and I can’t wait to try this one out it looks and sounds stunning. This is a gorgeous dessert. Anyone would be lucky to have some. 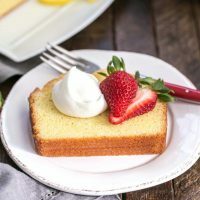 What a wonderful memory – love that you are sharing this dessert your mom used to make for your family 🙂 I love all lemon desserts and this lemon on a cloud looks marvelous! Gosh, how beautiful! I can just imagine eating that! The one thing that mystifies me is how to freeze it? I’ve not known anyone who could freeze meringue and have it come out as something serve-able, much less freeze meringue with a liquid, such as a curd on top. You say your mother would pop one in the freezer and you’d nick pieces (which sounds delightful to me!). Please, how can this be done well? Hi, Amy! This memory is my only experience with freezing meringue. I’d have the same trepidation as you…that the defrosted result would not be nearly as good as freshly made. I was only a child at the time, so wish I had more to go on…if we ever ate a defrosted one, I’m not sure my palate would have been mature enough to care if some quality was lost! Wish I could be of more help! This is my kind of dessert! It is beautiful and the lemon flavor sounds fabulous! I’m a sucker for cloud and lemons… put ’em together and I’m done for!. Just lovely.